Johns Hopkins Medicine has been tasked by the Centers for Disease Control and Prevention to lead a group and to design an interactive Web-based learning program that guides health care workers, nurses and physicians through government-approved protocols to aid clinicians as they provide care to patients who may be at risk of contracting the Ebola virus. The program trains health care providers in three critical areas: proper donning of personal protective equipment (PPE), the safe removal of gear, and active monitoring skills. All three modules will be available for free on the CDC’s website in the coming weeks and later available to the millions of iOS users on iTunes U. A release from the university reports that infection prevention and safety experts from the Johns Hopkins Armstrong Institute for Patient Safety and Quality are spearheading the initiative. Over the course of five days, the team worked with experts in infectious disease, nursing, systems engineering, content development ,and visual design from across the country to create an interactive learning experience for health care workers. The 40-member, multidisciplinary team included representatives from academic institutions such as Miami University in Oxford, Ohio to professional organizations such as the Association for Professionals in Infection Control and Epidemiology. 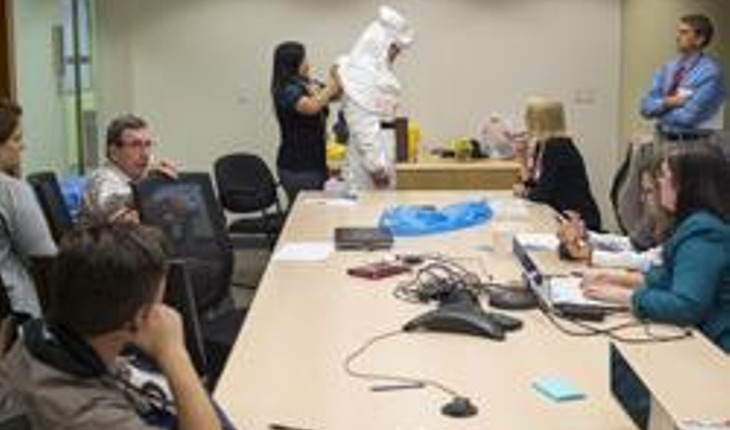 To prepare for the online program’s development, systems engineers visited The Johns Hopkins Hospital to watch a team of biocontainment experts to understand the specific environment and constraints faced by nurses and clinicians caring for patients who could possibly have contracted Ebola virus disease. Next, the full team reviewed the CDC guidelines and searched for possible discrepancies between the words written on the page, and the actions performed by care providers in the hospital. Elements such as limited space in a hospital room or even the anxiety and exhaustion of the health care workers can further complicate intensive situations. Using a variety of human factors and safety engineering methods, the team is identifying potential safety failures in the donning and doffing of protective gear and risk factors that could lead to contamination. Module scripts highlight these risks and how to mitigate them to make it easier for clinicians to comply with CDC guidelines in a real situation. These instructions are then tested in a simulation center, where novices and experts replicate the guidelines described. Revised and corrected steps are then filmed. The course will be available through iTunes U, the world’s largest online catalog of free educational content from top schools and prominent organizations. According to Forbes, more than 85 percent of physicians in the United States have iOS devices, providing instant access to this much-needed iTunes U content right on their Apple devices. Editor’s note: This image accompanying this article shows, from left to right: Justin Geko (JHH), Pete Doyle (JHH), Tina Hon (JHH), Pam Falk (APIC), Kerri Huber (JH Bayview), John Benson (APL), Tener Veenema (School of Nursing JHU), Lisa Tomlinson (APIC).